Union County Historical Society, Union County Tennessee. 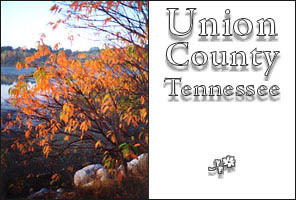 Tennessee Genealogy, Tennessee Local History Network, Family History, East Tennessee. Union County Historical Society, Inc.
UCHS meets the third Sunday of the month at the Roy Acuff Museum and Library in Maynardville at 2:30 PM. This recently updated book lists 331 cemeteries and 18, 318 names. $45.00 plus 5.00 shipping and handling. $3.00 shipping and handling on each of the new books. Page © Copyright 2002 Fred Smoot. Tennessee Local History Network is Part ot the American Local History Network.